​As an Equine Massage Practitioner, Alice works to ensure all the muscles in a horses body are working as efficiently and effectively as possible. When muscles are in a state of tension they loose flexibility, strength and movement, massage helps to relieve the stress in the body, removing toxins and increasing circulation. Alice takes a holistic approach with my treatments, looking at a horse as a whole and taking into consideration their routine and management. Alice completed her training with Centaur Equine Massage Training and the course is fully accredited with UK Rural Skills. 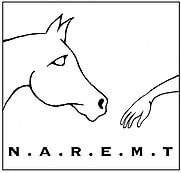 She is also on the National Association of Registered Equine Massage Therapists. Alice works within NAREMT's code of conduct. Massage is a complimentary therapy and should not be used as an alternative to Veterinary Advice.